Autism Society Philippines Ormoc Dist. 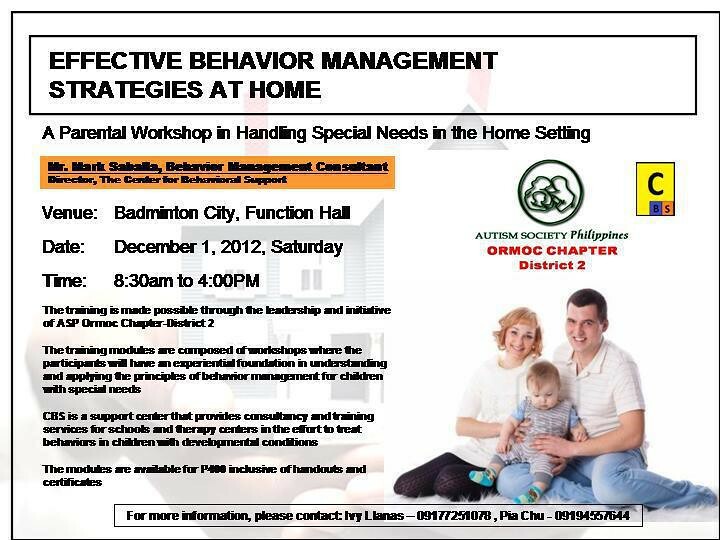 II Chapter - "Effective Behavior Management Strategies at Home" (A Parental Workshop in Handling Special Needs in the Home Setting) by Mr. Mark Saballa, Behavior Management Consultant and Director of The Center for Behavioral Support. This will be on December 1, 2012, Saturday from 8:30am - 4:00pm at Badminton City Function Hall. For more information, please contact: Ivy Llanas at 0917 725 1078 or Pia Chu at 0919 455 7644.